Once the seeds sprout and are a couple of inches tall, you should begin watering cilantro regularly. Once the plants have flowered and are starting to set seeds, you can water less often. The plants will also do well with an occasional application of water-soluble fertilizer during the first few weeks of life. 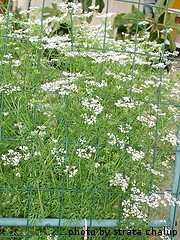 Cilantro plants grow quickly and the soil needs to remain moist during the first few weeks of growth. Water them gently so that no damage is done to the plants and the soil that is covering the root system is not eroded away. You can use a watering can, jog or a sprayer on the end of a hose. Just make sure the water pressure is low enough to avoid harming the plants. Water your cilantro plants a couple of times a week to keep the soil cool and moist. You can also apply a thin layer of mulch to help the soil retain moisture. Straw, grass clippings, chopped up leaves, wet strips of newspapers, etc... work well as mulch and can be tilled under at the end of the growing season. Once the plants boom and begin to set seeds, you won't have to water as often. The plants develop a lush canopy that shades the soil and keeps it moist. 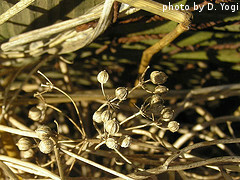 When seed production starts, stop watering all together so that the seeds will dry out quickly and be ready for harvest. Cilantro plants are best fertilized using a balanced, water-soluble fertilizer. Since you will be watering them a couple of times a week anyway, water-soluble fertilizers are the most convenient. Just mix them with water according to the instructions on the package and spray onto the plants when you would normally water them. You can fertilize them every other time you water, or about once a week. This will give them the boost they need to develop lots of edible foliage. Once the flowers appear and the plants begin to set seeds, you can stop applying fertilizer all-together. If you are interested in growing cilantro organically, you can work some compost or well-rotted manure into the soil before planting. You can also choose from a wide variety of organic fertilizer products that are available at your local garden center. 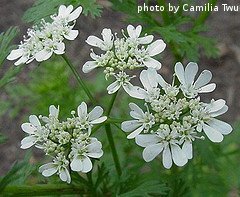 Now that you've learned about fertilizing and watering cilantro plants, it's time to think about harvesting the leaves and seeds.